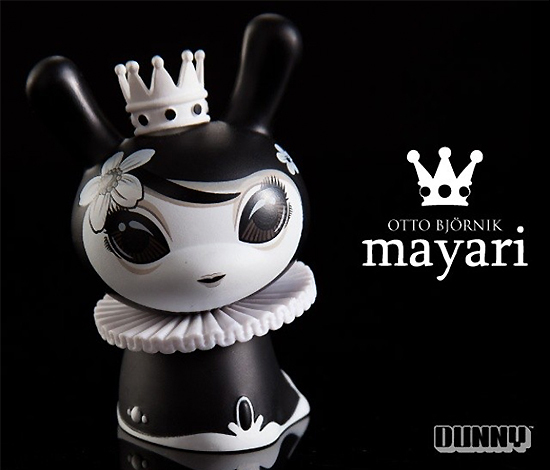 Otto Björnik, architect, artist, and storyteller, has released a brand-new Dunny release courtesy of Kidrobot, simply titled Mayari. Standing at 3″ tall, Mayari is both character and myth, coming to life with a fine line style that mimics Björnik’s intricate pen and ink drawings. Coming with her jeweled crown and regal attire, this beautiful new Dunny release is available now in her black colorway at TOMODACHI, both through out Rosedale Shopping Center location as well as on our online store! Retailing for $14.99 each, vinyl fans should definitely take home one of these little queens while they can! Otto Björnik is as much storyteller as artist, mixing childhood memories and fairy tales within his intricately illustrated work. Originally from the Phillipines, Björnik is an architect by training who works mostly in the fine and delicate world of pen and ink, though also forays into painting and customizing, creating beautifully detailed figures with complex personalities. Working together with companies like Yahoo!, Kidrobot, and Clutter, Björnik has displayed his art all over the world, from the United States, United Kingdoms, Germany, Phillipines, Singapore, and Mongolia.